Communication with Hayabusa2 is via radio waves that are transmitted and received by large antenna at ground stations on Earth. Our website “Haya2NOW” shows these communications in real time. The website is in Japanese, but we will describe below the information in each section so you can follow current operations along with us! Please note: Haya2NOW is a public information site. Even when everything is fine with the spacecraft, display errors can occur due to web browser settings or network issues. We may also temporarily take the site offline for events such as system maintenance. If this occurs, please try to access the site again later. The screen is approximately divided into an upper section where you see an illustration of the spacecraft, and the lower section starting form the subheading, “UDSC64”. If you are looking at the website on a smart phone or narrow browser window, the information on the upper section may have dropped onto to multiple lines. The lower section scrolls horizontally on narrow browser windows. A simple pop-up explanation (in Japanese) for each section will appear when you roll your pointer over an item, or tap on a touch screen. In Figure 2 below, we’ve divided the screen shot shown in Figure 1 into different section and we’ll explain what is shown in each box. A: The current date and time is shown with the format year / month / day, hour: minute: second. This is the local time at your location, so accessing the website in Japan will result in JST (Japan time) being displayed. If you are looking at the website from New York, then ET will be displayed. B: The time elapsed since Hayabusa2 was launched. The launch time, “L” was December 3, 2014 at 13:22:04 JST. 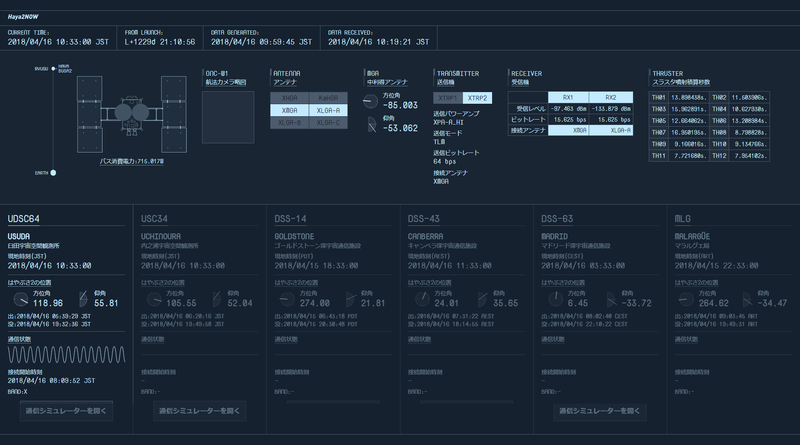 C: The time the displayed data was generated by Hayabusa2 (Probe time). D: The time the data was received by the ground station. E: Indicates where Hayabusa2 is located between the Earth and Ryugu. In reality, Hayabusa2 does not follow a straight line between the Earth and Ryugu, but this figure is easy for seeing the relative distance between the Earth and Hayabusa2, and Hayabusa2 and Ryugu. When Hayabusa2 overlaps with Ryugu, the spacecraft is exploring the asteroid. F: When one of Hayabusa2’s two high-gain antennas (powerful radio antennae that resemble a round dish) is being used, that antenna will flash on the diagram. Also, the power (bus power: power used for instruments, temperature control, communications etc.) that is currently being consumed by Hayabusa2 is displayed. G: When Hayabusa2 is approaching Ryugu, the position and size of Ryugu from the onboard wide angle optical navigation camera (ONC-W1) will be displayed as a schematic drawing. H: Indicates the antenna currently being used by Hayabusa2: high-gain antenna (HGA: XHGA and KaHGA), medium-gain antenna (MGA: XMGA), low-gain antenna (LGA: XLGA-A, XLGA-B and XLGA-C). I: Indicates the direction that the medium-gain antenna (MGA) is facing. This is the antenna that turns to face the Earth in order transmit date back to the ground stations. Unlike the round dish high-gain antennas, the MGA resembles a black horn on a steerable disk. J: The status of the two transmitters (XTRP1 and XTRP2) on Hayabusa2 for sending messages to Earth via the antennas. The transmitter currently in use, the power amplifier being used (A or B and the mode), the transmission mode, communication speed (the bit rate) and the currently connected antenna are shown. K: The status of the two receivers (RX1 and RX2) on Hayabusa2 for receiving instructions from Earth via the antennas. The reception level for radio waves coming from the ground stations, the communication speed (bit rate) and the currently connected antenna are indicated for each receiver. L: The total number of seconds each of the twelve thrusters (chemical propulsion engines) on Hayabusa2 have been operated since a fixed common date. These thrusters are used primarily for altitude and orbit control around Ryugu and to allow the reaction wheels (that turn the spacecraft) to spin back down so they do not get saturated from turning to their maximum point. Bigger changes in velocity en-route to Ryugu are mainly performed with the Ion Engine System (IES). M: UDSC64 refers to the 64m diameter parabolic antenna at Usuda Deep Space Center (Saku City, Nagano Prefecture in Japan). When a wave appears in this section as shown in Figure 2, this ground station is currently communicating with Hayabusa2. N: USC34 is the 34m diameter parabolic antenna at Japan’s Uchinoura Space Center. In Figure 2, we do not see a wave, which indicats that USC34 is not used currently for communicating with Hayabusa2. The antenna shown here may be currently communicating with other spacecraft or satellites, but only communication with Hayabusa2 is shown on Haya2NOW. To the right of USC34 are listed the overseas antenna that also talk with Hayabusa2 as our planet rotates. These are DSS-14 (Goldstone, USA), DSS-43 (Canberra, Australia), DSS-63 (Madrid, Spain) and MLG (Malargüe, Argentina). Below a few of the listed ground station antenna there is a button labeled “通信シミュレーターを開く” (Open communication simulator). 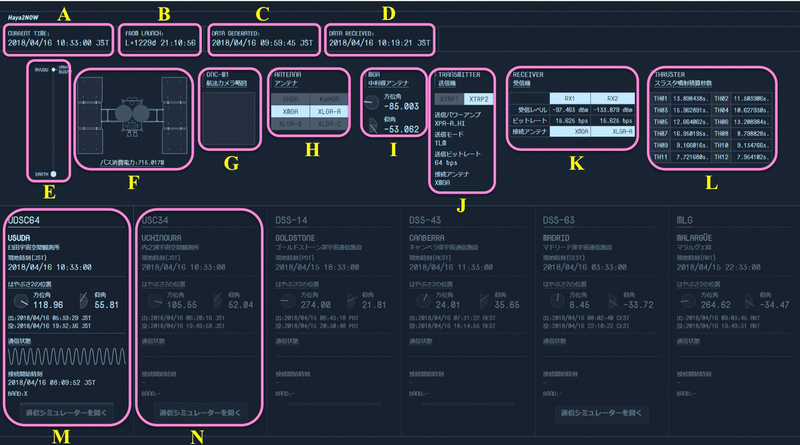 Clicking on this opens another screen that allows you to experience how long a command takes to reach the current location of Hayabusa2 from the ground station. As Hayabusa2 reaches Ryugu, the wait may be as long as 40 minutes for a message to reach Hayabusa2 and return to Earth. We hope you enjoy watching Haya2NOW!